He was just going to pick up bicycles for a charity event. Instead, this real-life Santa turned his stop at a central Florida Wal-Mart into an early Christmas delivery for 76 strangers. Greg Parady, 40, was at The Villages Wal-Mart last Saturday to pick up the bikes for a Toys-for-Tots drive held by his financial planning firm, when he overheard a woman saying she didn’t know if she could afford her layaway this year and might have to cancel her order. “It just kind of unfolded,” said Parady. “I wandered into the layaway section and it’s kind of a depressing place … over by the bathrooms and bikes, it’s kind of a random potpourri.” He asked the manager to tally up all the layaways, thinking it couldn’t be that much. It totaled $89,000. Parady was immediately struck by how many families striving to put presents under the tree that represented. He said he couldn’t pay off that much, but he’d like to take care of about $21,000. Then he got to swiping. Not just for those on the list, but for people on the spot. Some of them had walked up to the counter thinking they were going to have to cancel their layaway orders. “He would swipe his card and say, ‘Merry Christmas,'” said Parady’s managing partner, Cindy Nazzaro, 58, who was there with Greg to help pick up the bikes. 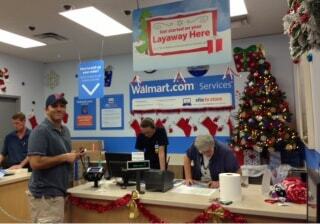 Greg Parady smiles as he pays off 76 strangers layaways at a central Florida Wal-Mart on Saturday, December 7th, 2013. Overwhelmed, the woman, who appeared to be in her 20s, began to cry and had to sit down on a bench. “Every time I looked over at her she would mouth the words, ‘Thank you,'” said Parady. The spree was so large and unexpected that Greg’s banks began to decline the transactions, flagging them as potential fraud. Parady worked three different cards, his cellphone, and two different registers. Since that day the emails, videos and stories have been pouring in. Layaway, which lets people pay off their merchandise slowly over a few weeks before taking it, is a popular way for those on a budget to save up for bigger items or bundles, but those final payments can still be a stretch for scrimpers and savers. “They’re working paycheck to paycheck. You’ve got the best intentions when you put them on layaway. If nothing unforeseen happens you’re OK, but if one little thing happens that upsets the whole apple cart,” said Wal-Mart’s Davis. Inspired by stories like Parady’s or simply moved by the Christmas spirit, layaway Santas touching down across the country this holiday season are helping bridge that budget gap for some lucky, and grateful, families. Wal-Mart said it has tracked more than 1,000 instances so far this season of strangers paying down others’ layaway accounts. Kmart said strangers have paid more than $1.5 million in other’s layaway contracts over the years. Toy “R” Us said they recorded 794 layaway Santa visits in 2012, matching each one with a $200 donation to Toys for Tots, for a total of $158,800. For this year, it’s pledged to donate up to $1 million. An Oklahoma City woman paid off 10 to 20 accounts worth thousands of dollars at her local Wal-Mart, KFOR reports. An anonymous giver in Maine spread cheer with $2,000 at her local Renys department store. And several layaway angels paid bills at a Shillington, Pa., Kmart, prompting a mother who had $450 in toys taken care of by a stranger to pay it forward. Stacey Weidner then spent the same amount at Toys “R” Us on a needy child her daughter’s age recommended to her by the school nurse.